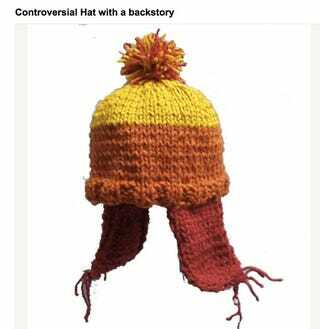 Clever Firefly fan sells a "Jane hat" with a "controversial backstory"
Earlier this week, we learned that after 10 years of happy Jayne hat Etsy shopping, Fox was handing out cease and desist letters to all "non licensed" Jayne hat sellers. The Browncoats were pissed. But now it looks like the Whedonites have outsmarted the Alliance once again. Major props to Etsy seller CraftOtaku for the chutzpah for posting this hilarious little riff on the Jayne hat. There's even a whole backstory about the hat for the girl named Jane, we urge you to read it. In other, brighter Jayne Hat News, ThinkGeek, the distributor of the officially licensed Firefly hats has announced that they will donate 100% of all Jayne profits from to Can't Stop the Serenity until they run out of stock. They maintain that they were never apart of the takedown letters and will "continue making that donation until we run out of stock of Jayne Hats." Which is a nice gesture, in a silly debate over something that has been homemade by fans for many many years. The best part of this whole thing: The ThinkGeek mascot (timmy) sports a tiny Jayne Hat that was originally purchased from an online knitter.